Traditional Use: Widely known for its healing properties for the skin. 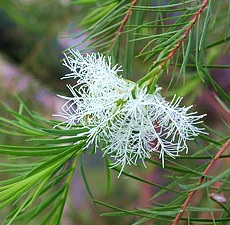 Tea tree oil is used for anything from bug bites to sunburns. makes a great addition to most skin care products. A simple way to use it is adding the oil to aloe vera gel. Of Interest: In World War ll cutters and producers of tea tree were exempt from military service until enough essential oil had been accumulated. It was issued to each soldier and sailor for them to treat tropical infections and other problems of warfare, including wounds. Safety Data: May cause temporary skin irritation. Not for internal use.